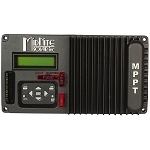 The Classic 150 MPPT Charge Controller has Arc Fault, Ground Fault, free web monitoring, a graphics panel and Solar, Hydro and Wind Modes. The Classic 150 has a maximum output current of 96 amps, an operating voltage of 150 volts and works with 12 to 72 volt battery systems. The FREE MidNite Solar Local Application enables you to monitor your Classics over your local network or the Internet. As with the whole Classic Line, the Classic 150 has MidNite’s exclusive HyperVOC which extends VOC limits when needed.